What a pleasant surprise this fast-paced slasher. You know what�s fun sometimes? Haphazardly starting a film without knowing what it is about and afterward admitting you were pleasantly surprised. That�s my experience with this film. A film with a bit of suspense and tension. And thanks to the short playing time you don�t have the feeling it was a waste of time. Even though it isn�t a blockbuster. It�s also the first time that I didn�t feel sorry for the two teenagers Sam (Gregg Sulkin) and Brady (Garrett Clayton). In this movie, these two spoiled, annoying brats reap what they have sown. And the whole time I was expecting the rest of the gang to pop up suddenly and announce it was all one big joke. Like many others, I found the two main actors irritating. But then you have to admit their acting was masterful. Because wasn�t that the whole point? After all, they are two obnoxious young boys who pull pranks on others. They make extreme prank calls. The only thing I couldn�t believe was the fact that those pranks were watched so massively after posting them online. Is that a reflection of what our society is evolving into? A society where gloating is self-evident? 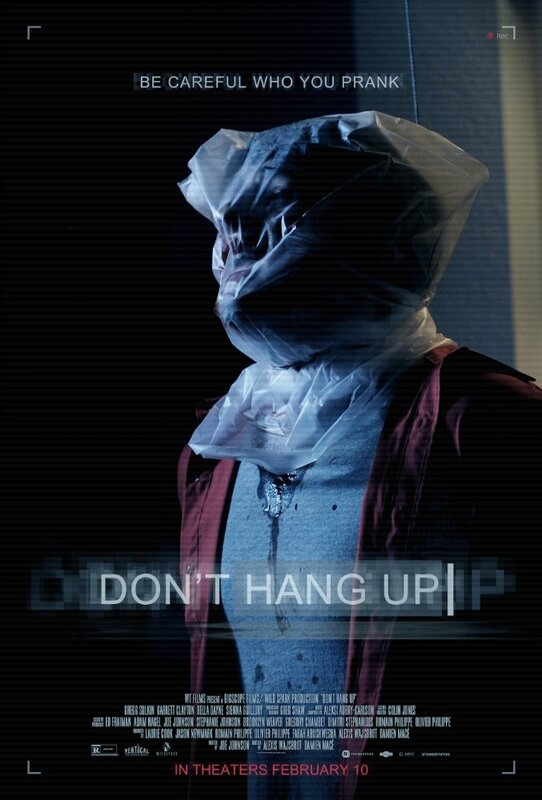 �Don�t hang up� is a low-budget film. That�s noticeable. Everything takes place mainly in the parental home of Sam. The camera work is uncomplicated but to-the-point. Besides a camera moving through the set in a penetrating way, it generally looks mediocre. It gets bloody in this film, but the used �practical effects� don�t look spectacular either. And yet this film was worth a watch and can easily be added to a whole series of other films from the same mid-level. Because of the short playing time, the pace is swift in this movie and you don�t have to wait long before the unwanted caller turns up. And still despite the pace, one manages to increase the tension gradually. The sinister caller has a rather frightening voice (a Jigsaw-like tone), which in turn makes it extra creepy. His technological omnipotence was slightly exaggerated though. And despite the fact that it�s about pretty arrogant and unsympathetic youth, I found the friendship and expression of sacrifice commendable. But all in all, I couldn�t avoid gloating and a convincing inner �Yes!� resounded at the end.